Here’s an outstanding deal that you definitely need to share! 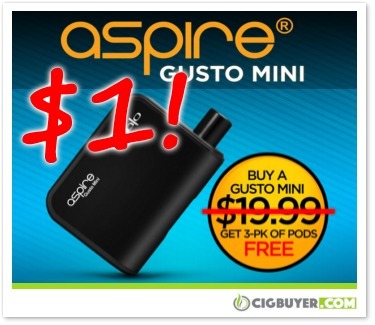 FIRST-TIME CUSTOMERS ONLY can get an Aspire Gusto Mini Pod System from Halo Cigs for only $1.00 (+ $5 shipping)!!! Yup, you read that right. To celebrate World No Tobacco Day, Halo will provide everything you need to get started with vaping, including the Gusto Mini with 900mAh battery, 4.2ml pre-filled Halo pod (Tribeca or Subzero) and micro-USB charger. If you know any smokers who are looking to kick a nasty smoking habit… please pass this deal along! * This special deal expires on June 15, 2018. Good while supplies last.